Recently, when I was learning more about Mabel Winters, my great-grandmother, and her family in Nova Scotia, I ran into a name that was very familiar to me – Lufkin. Mabel’s great-great-grandparents were Amos Hilton and Hannah Lufkin of Yarmouth County, Nova Scotia. Amos Hilton was a New England Planter, a settler who left Essex County, Massachusetts for Nova Scotia in the 1760s. As for Hannah Lufkin, she was the daughter of Jacob Lufkin, and was Amos’ second wife. Lufkin is a well-known name on Cape Ann, a region in northeastern Massachusetts. As a former resident, I have encountered this name many times, particularly in Gloucester and Essex. But learning more about the Lufkins revealed an even more familiar name – Haskell. [Discoveries] like this make genealogy that much more tangible. Ultimately, I learned that Mabel was a descendant of William Haskell of Gloucester. William Haskell first settled at Salem with his brothers, but later removed to Gloucester by the 1640s, where he would remain until his death in 1693. Today, the William Haskell House sits just off Grant Circle, one of the town’s rotaries. Many of you may have driven around Grant Circle as you were headed to one of Gloucester’s beaches. When I lived on Cape Ann, I drove past this house almost every day, completely unaware that my ancestor once lived there. To me, discoveries like this make genealogy that much more tangible. 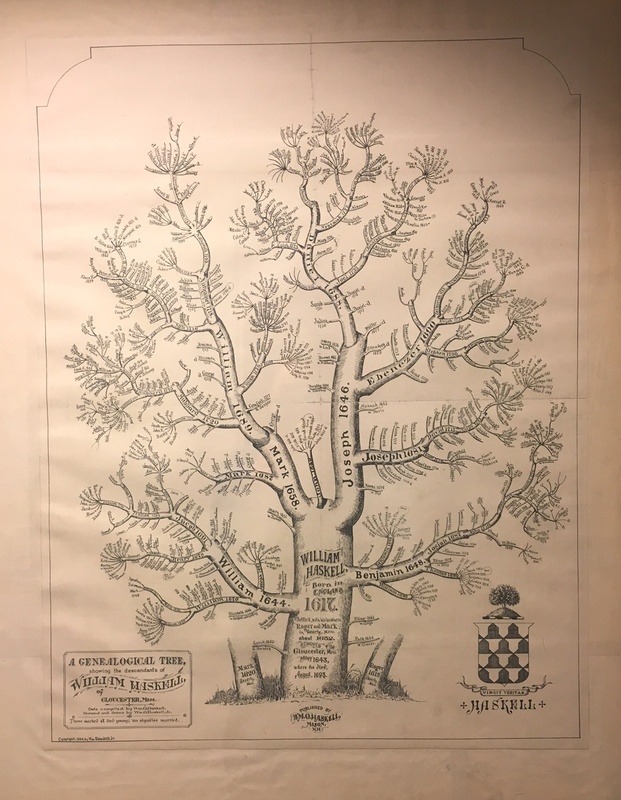 And even closer to home, here at the NEHGS Library, the Haskell Family Tree is on display on the first floor, and serves as a nice reminder of my Essex County roots. Sheilagh I’ve had the same experience when researching my wife’s ancestors. She is a descendant of “Elder” James Blake (1624-1700) who built the Blake House for his son, James. It’s Boston’s oldest house according to the Dorchester Historical Society. 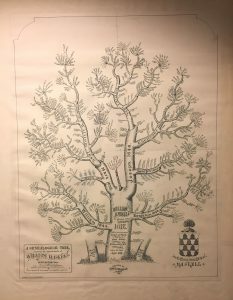 I’ve been researching family for more than 50 years, and have seen many formats for family trees. The Haskell Tree is very likely the most artistic and innovative one that I’ve had the pleasure of seeing. Thanks for sharing it !! Sheilagh– You are so right! I am so blessed to be able to walk the same streets my ancestors knew, see their houses, and live with their things. Those experiences build interest in one’s family and create appreciation of all they went through and did with their lives. What will future generations think of us and what we did with our lives? My first genealogical project was tracing my line to a Revolutionary War soldier — and I did most of my work at our vacation home on Deep Creek Lake in western Maryland. I felt a deep kinship when I realized that my ancestor, William Crawford, had grown up and lived very nearby, in Pennsylvania, and likely walked in many of the places we frequent up here and on our way here from Northern Virginia. It makes it so personal! I moved from the North shore of Boston to the south shore 2 years ago & found ancestors that lived on my street! I was living in Florida but I heard of a Griswold Family gathering that was to meet in Windsor, CT where my son lived at the time. We visited many interesting spots that day and one was a cemetery. The road around the area seemed familiar and on returning to my son’s home I asked him what was behind his house beyond a shall patch of woods. “Oh just an old cemetery,” he replied. He was living on land his ancestors were part of in the 17th century. As Ohio natives we did not even know we had early New England ancestors until ten years ago! Yes! so true! 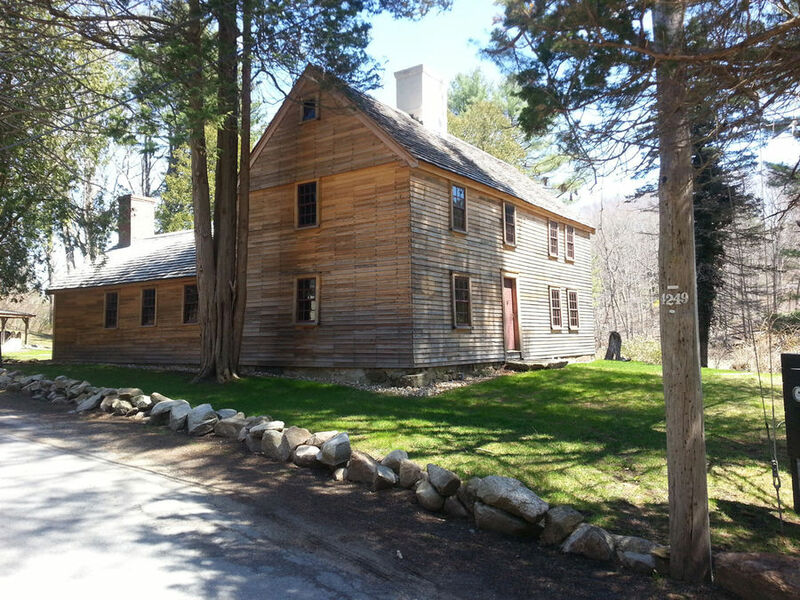 My maternal lineage made their home in MA, CT, NY, VT, in the 1600-1700’s, before going further afield. In the 1980’s my husband’s job took us to this part of the country, and my not knowing anything about a connection to this area…..and still somehow in retrospect, had a sense of belonging……and did not feel like a stranger. 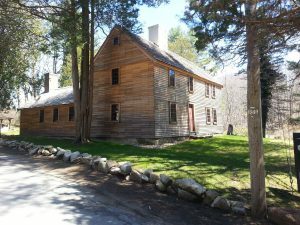 Our main stay with friends was in Topsfield, MA. Our friend toured the area with us, so I also saw the town of Ipsewich, both towns, I had ancestors who lived there. I mentioned going to Plymouth Rock, was voted down……with, it’s just a rock……….OK. Now, it’s more than that. Sheilagh, Thanks for sharing. I’ve had the same experience and have wondered how the stories of places get lost. Sheilagh, thank you for sharing such a wonderful story! I have also experienced this wonder when I lived in Scotland. My Christie (and Watt, Pirie, Stott, Rennie…) ancestors were from Aberdeenshire, many of them lived in the city of Aberdeen. To walk down the streets they walked on every day, and see the Kirks (churches) they attended, was just amazing. I would recommend for anyone to visit the places your people are from. You will feel their energy. I was so thrilled to learn that just down the street in Jamestown VA one of my “grandpas” lived there from 1610 to 1614. Then he went back to England and wound up on the Mayflower to land in Plymouth MA. I visit Jamestown Island frequently and wonder if he saw the same views I see today. Sheilagh, I recently learned that the neighborhood I have lived in since 1974 was once part of my seventeenth century ancestor Jonathan Hill’s farm. Some coincidence- too bad the land went out of my family centuries ago. Isn’t genealogy great, though. We left south side Chicago to go to California when I was 5…I went back when I was 11 for one school year to the extreme north end, riding my bike to the beach in Evanston which took me by a beautiful graveyard (Calvary). 20 years later I inherited the family cemetery deed to a plot in Calvary! The internment list from 1870 to early 1900’s were all my original immigrant great great grandparents and assorted relatives from Ireland – none of whom I was aware of! Sadly no grave markers exist, but I have been able to identify almost all the connections so I hope to have a marker made in the future. The kicker for me was to recently see on google maps that my 5th grade school backs up to that same graveyard! Crazy! I too have been very fortunate to walk the streets of New Bedford, MA where many of my ancestors lived. Within the last six months I was welcomed into the original home of my great great grandmother, Abby Taber Hunt, by the new owners who are renovating it. Such a treat to walk in the nursery of my great grandmother, to climb to the widow’s walk where walked and look out to see in four directions and the house of her father across the street. I then leaned of her garden, the steps with the iron railing still extant. I wanted to talk with her … my 4 great grandmother’s house where her nephew lived is next door; my great great grandfather’s house, a station on the underground railroad, is not too many blocks away. I had a similar experience on the North Shore of Boston where I’ve lived for more than 20 years. I drive through Ipswich with its 17th C homes several times a week, Imagine my surprise when I traced my great grandmother Johnson (from upstate NY) straight back to John Johnson who arrived in Ipswich in 1635. And that opened the door to other early settlers in Newbury and Andover – all places I’ve been going for years without realizing the connections. Sheilagh, I was surprised to see the name Mary Winters in posting. If that was her married name, as mine is, can you identify her husband? I am always researching a collateral line when I can. About 20 years ago, I was living in Quincy, Mass. and, through a genealogy helplist, doing volunteer lookups in the Thomas Crane Public Library’s Sprague Collection (an index card collection on the old families of Braintree and surrounding towns). I answered one query on a member of the Thayer family, and determined that my condo was situated on a part of the farm of the querier’s Thayer ancestor. About 5 years ago (and 10 years after moving away from Quincy), I broke through a brick wall on one of my lines, and discovered that I am descended from the Thayers of Braintree. Tracing the details of this line is still on my “to do” list, and I don’t have a copy of the information I copied for the other researcher, but I can say that in the 1990s I lived on land which had been farmed by an ancestor or sibling of a relative in the late 1600s.